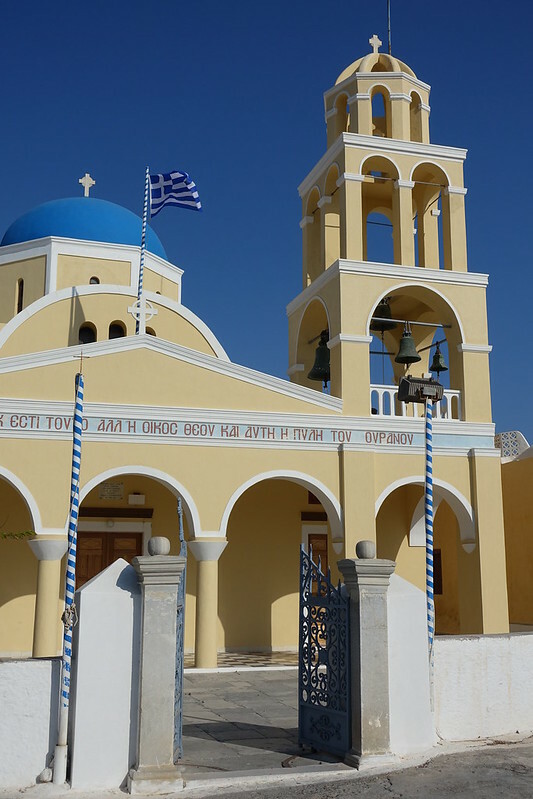 Post 6 of a series – you can read my other Greece posts here. 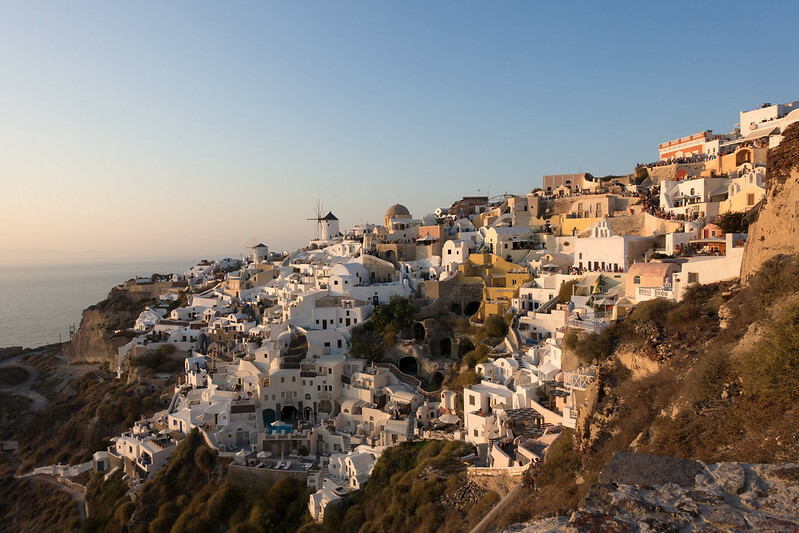 Oia, known as Santorini’s most picturesque town and famous for its much-photographed sunset, was an absolute must during our time on the island. 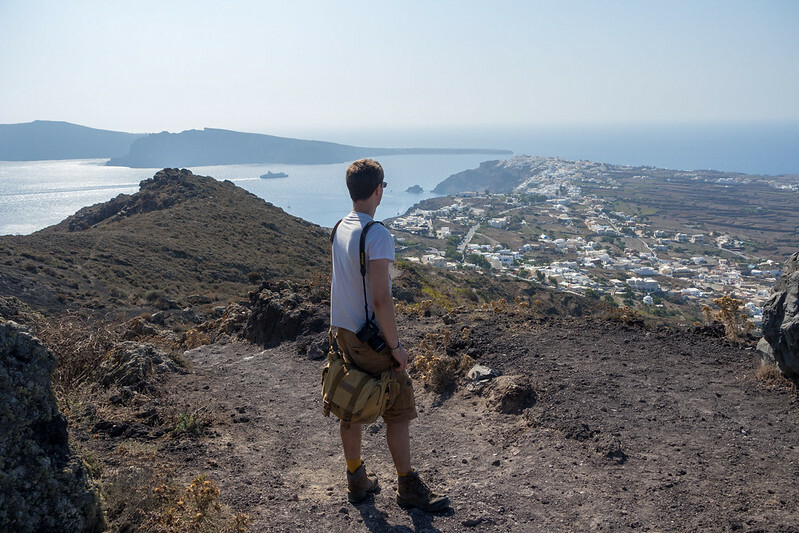 We figured that with the distance between Firostefani and Oia being a mere 6 miles (10 kilometres) and there being so much natural beauty to enjoy, the only reasonable option was to walk there along the coast. 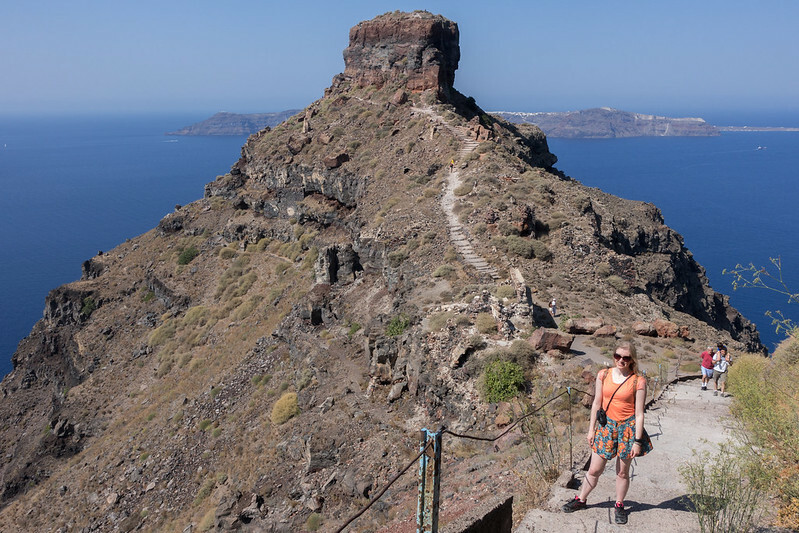 A sizable detour to Skaros Rock and the relentlessly hot sun made the journey a little more challenging than we first thought, but it was one of the most rewarding hikes I’ve ever done. 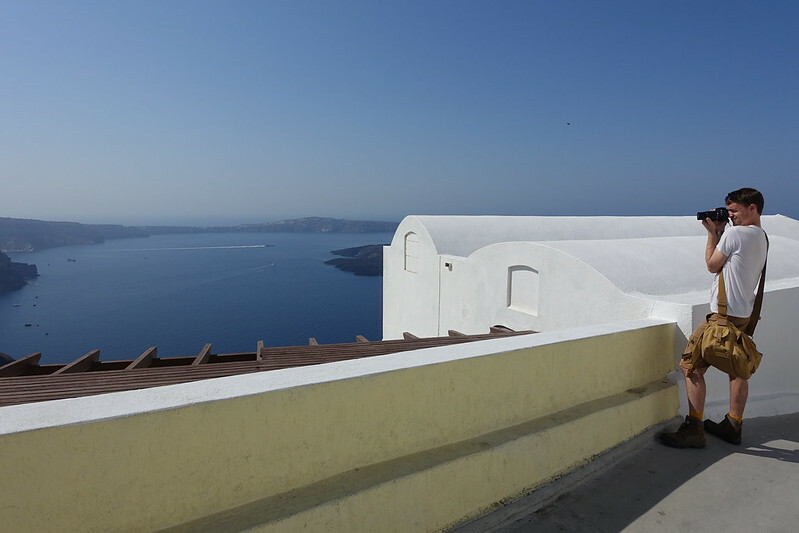 We had a quick breakfast at the Ersi Villas complex before setting off up the coastal path from Firostefani. 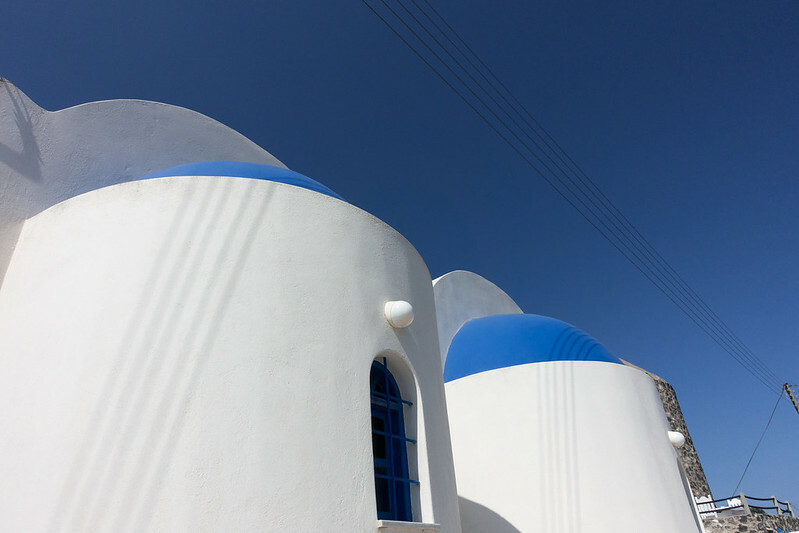 The sky was deep blue and the sun shining brightly, illuminating the white buildings to a blinding brilliance. 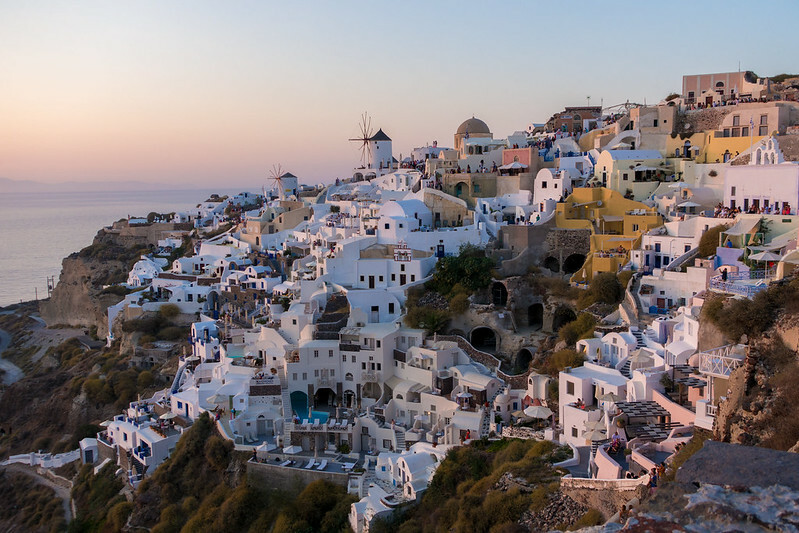 I hadn’t thought it was possible, but Firostefani looked even more beautiful in the morning’s glare than in the previous evening’s dusk. 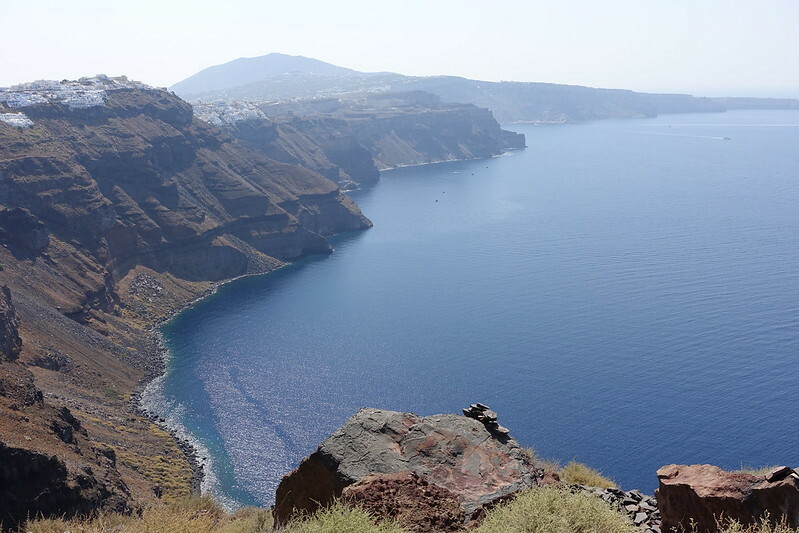 We followed Firostefani’s cobbled grey path up out of the town and further along the coast, until we turned a corner and caught sight of Skaros Rock: a large mound of knobbly rock rising dramatically out of the sea. 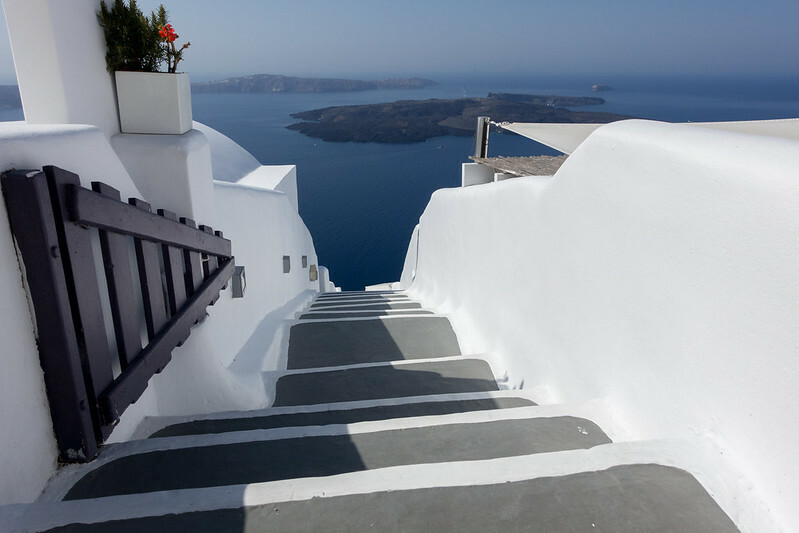 Though we knew we still had a long way to go, we had to make a detour to climb it. 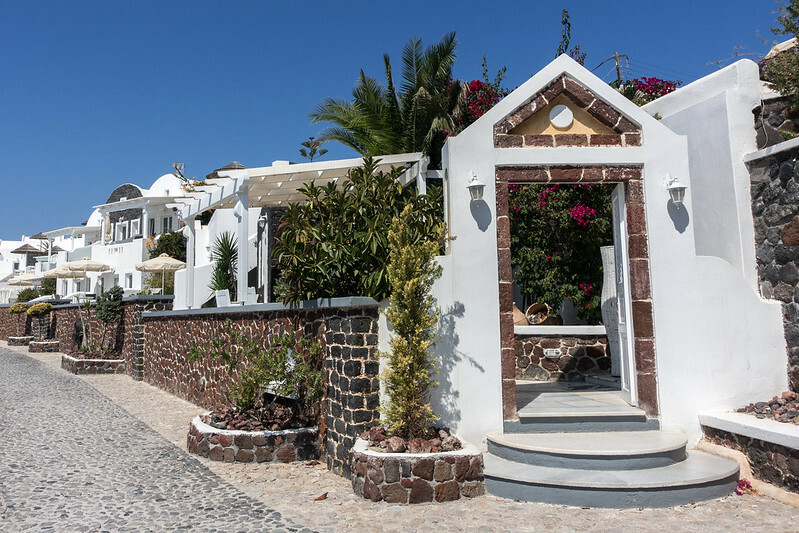 Between us and Skaros Rock was a long staircase embedded in the rock, past more stone-built villas with small turquoise swimming pools and sun-loungers. Along the way we caught sight of a bride and groom getting their wedding photos taken in front of the rock – the first of several just-married couples we spotted that day. It wasn’t hard to see why they’d chosen to get married here. Once we’d reached the bottom of the stairs, it was up all the way to the top of the rock. 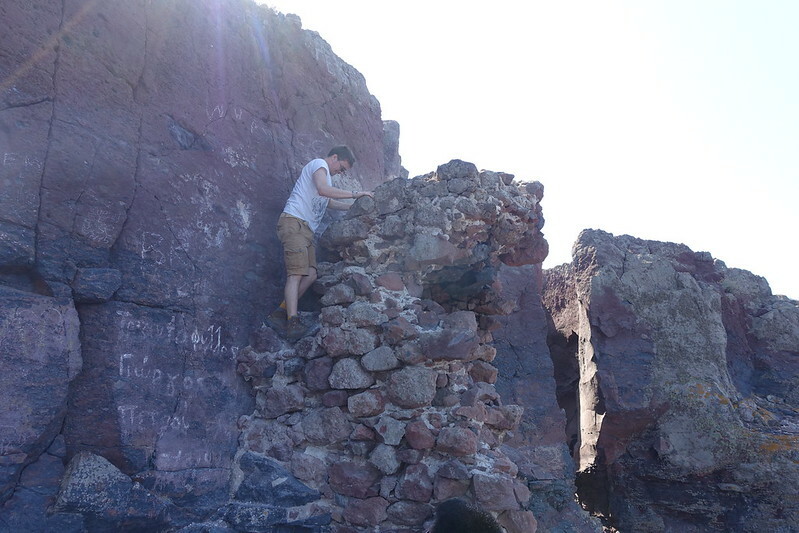 It was an enjoyable climb, full of intriguing nooks and crannies, hanging rocks and spectacular views. At the top we reached what seemed to be a dead end, where a few fellow tourists were sitting. They were discussing climbing up the precarious-looking pile of rocks between our plateau and what looked like the rock’s actual summit. There was no way I was clambering up there, but, of course, Steve couldn’t resist. 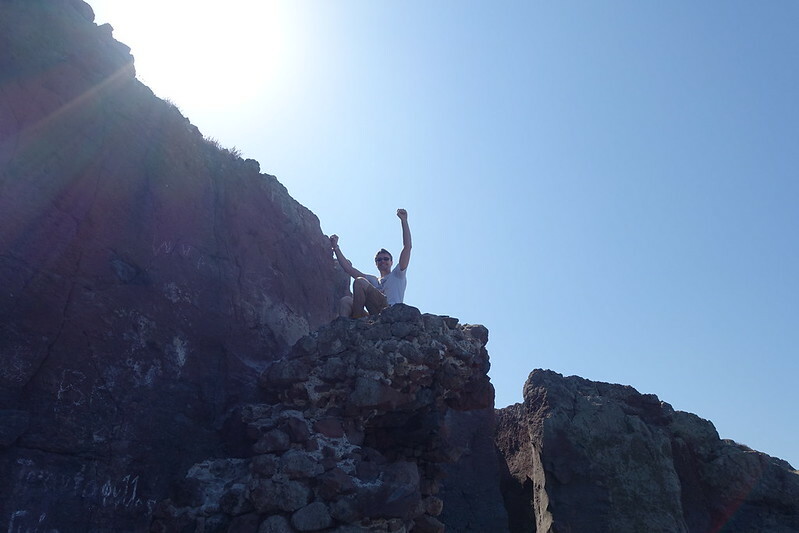 My heart was in my throat as he disappeared up the rock face, but thankfully he came back down in one piece! 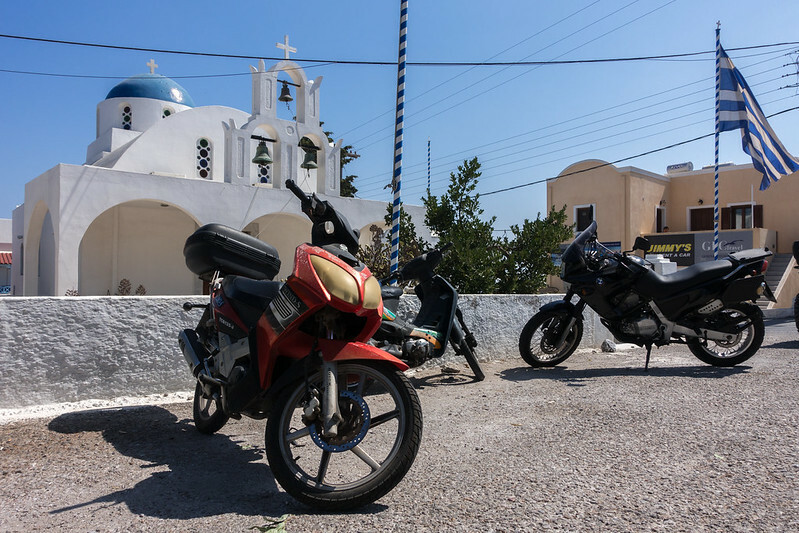 Skaros Rock conquered, we returned to the mainland and continued to wind our way through the town of Imerovigli, passing further resplendent villas and pristine churches assembled from assorted arches, domes and squares. Among all the pastel paint and concrete, nature made itself known through bursts of fuchsia flowers spilling over walls and palm trees casting long shadows across our path. 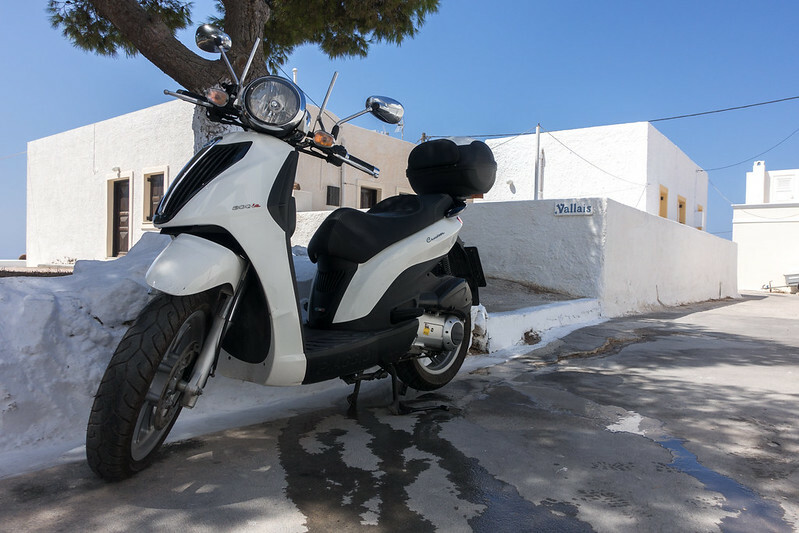 Sleek motorbikes were another common sight, providing a finishing stroke of European style. 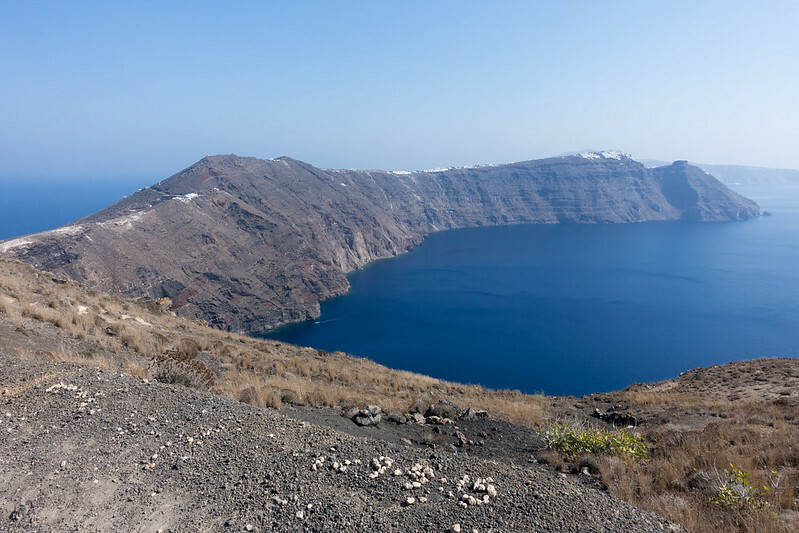 Past Imerovigli, it was just us and the wilderness until we reached distant Finikia, followed shortly by Oia. 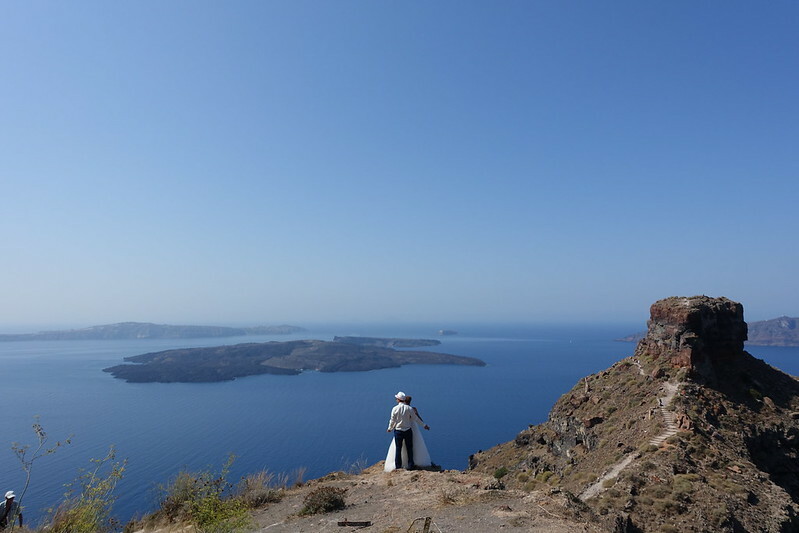 We followed the sun-bleached stone path round the curve of the island, our view of the famous Santorini caldera changing as we went. 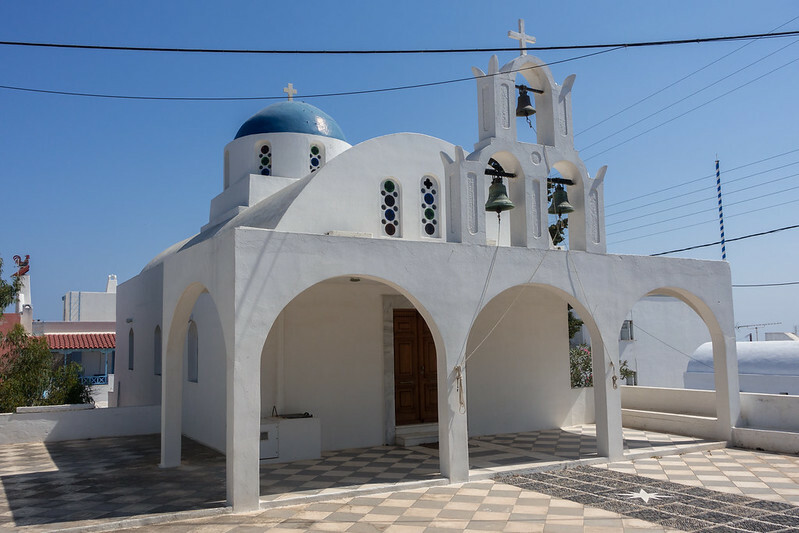 Besides the spectacular vistas, we saw little but rocky scree and hardy vegetation – except for the occasional deserted church, no less pristine for its wild setting. 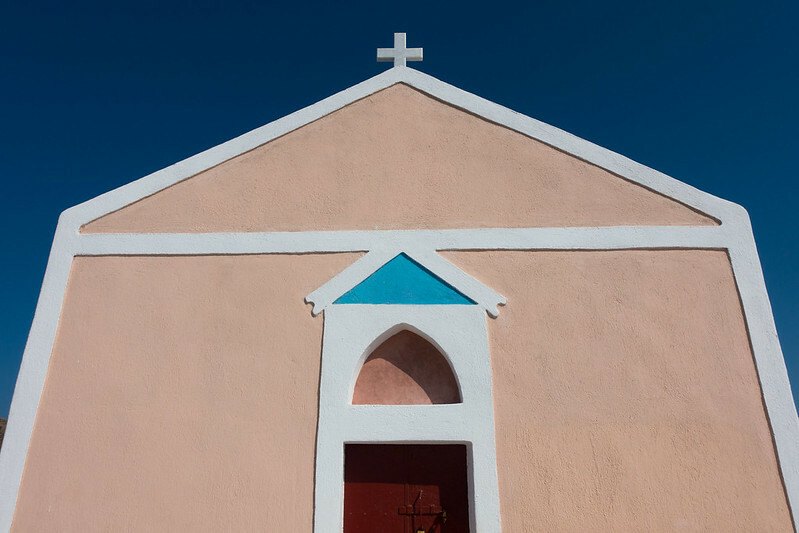 My favourite was an unusually colourful one, painted salmon pink with turquoise-blue accents. 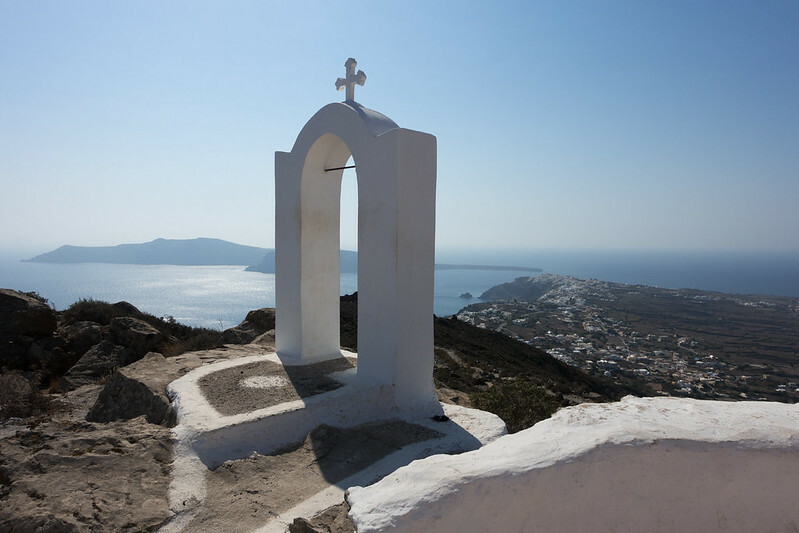 Beside it was a free-standing white arch that provided a glorious panorama over the island. 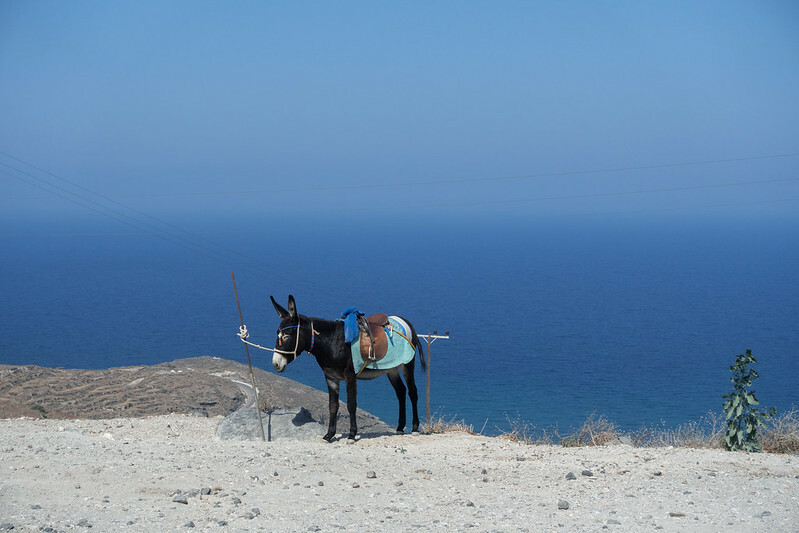 We continued past tethered donkeys and along a precarious scree-covered slope, until eventually we caught sight of Finikia and Oia at the island’s tip, now a simple downhill walk away. 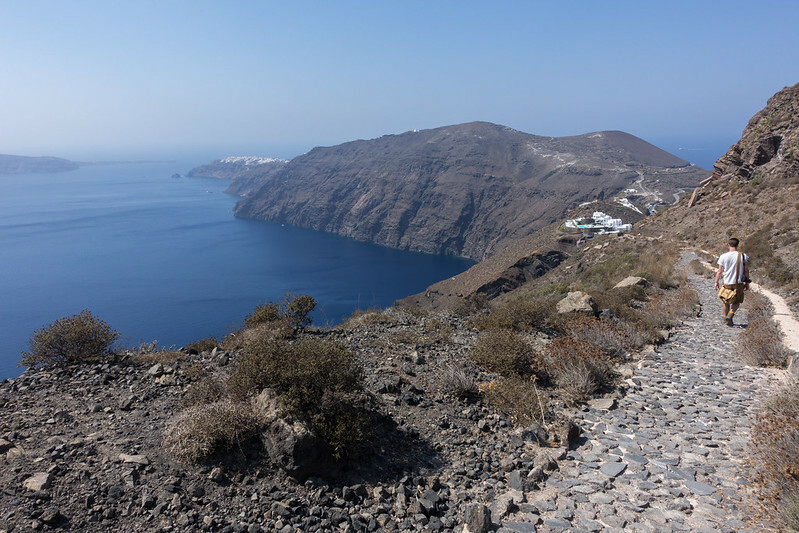 Re-entering civilisation, we began passing people coming the other way and reassuring them that yes, this was the path to Fira! 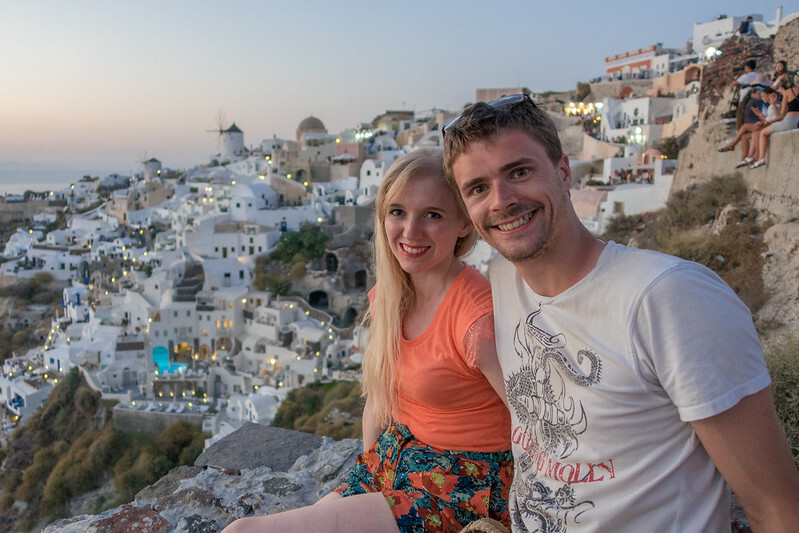 The path became more even, the buildings more dense and soon we found ourselves amid the hustle-bustle of Oia, which is evidently Greece’s wedding capital. 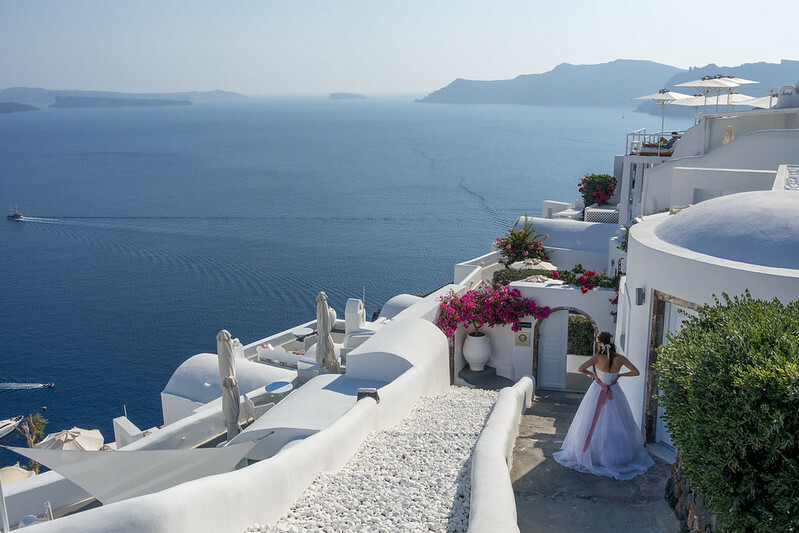 We passed a ceremony underway at a tall yellow and blue church, another bride and groom seemingly taking their own wedding photos, and a solitary bride who could have passed for a princess, gazing out to sea as if contemplating her happy-ever-after. Yet as charmed as I was by all the romance, my overwhelming feeling at this point was hunger. The walk had taken longer than we’d thought and, unlike us, we’d managed to skip lunch entirely. 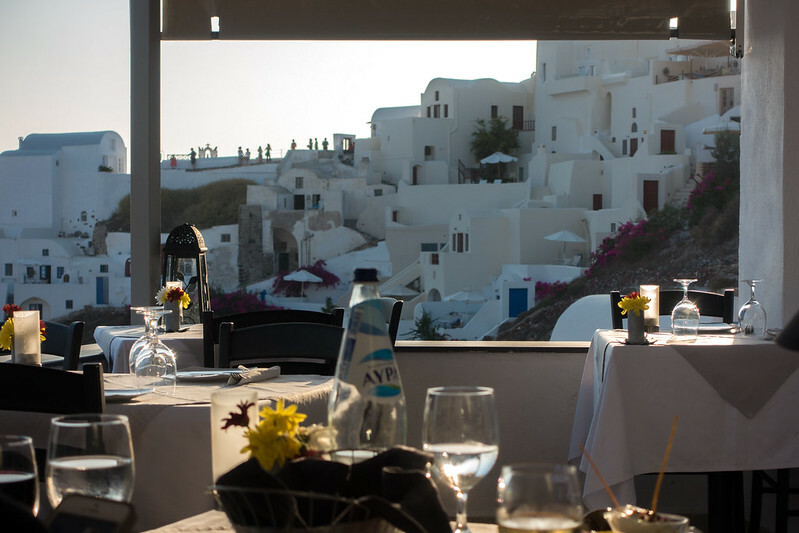 Fortunately there were plenty of restaurants to choose from in Oia, albeit rather more expensive than those we’d seen previously. 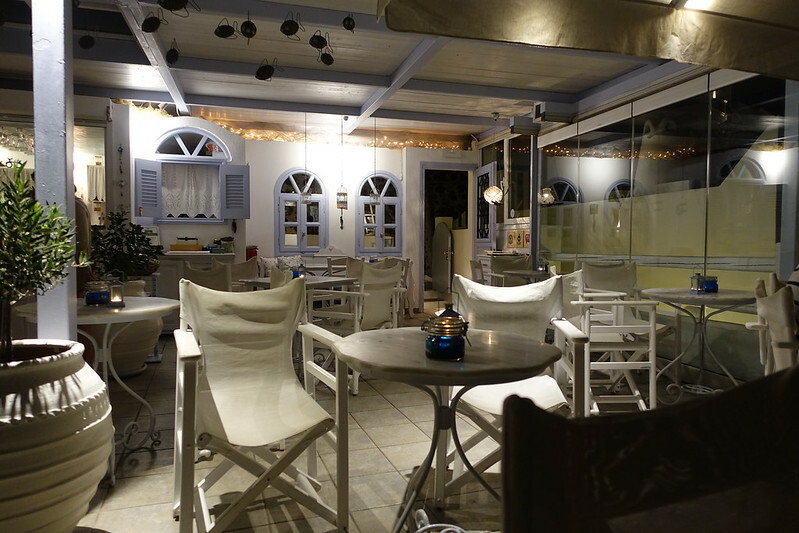 We chose to go to Floga, a refined yet laid-back restaurant set into the hillside and offering serene sea views. 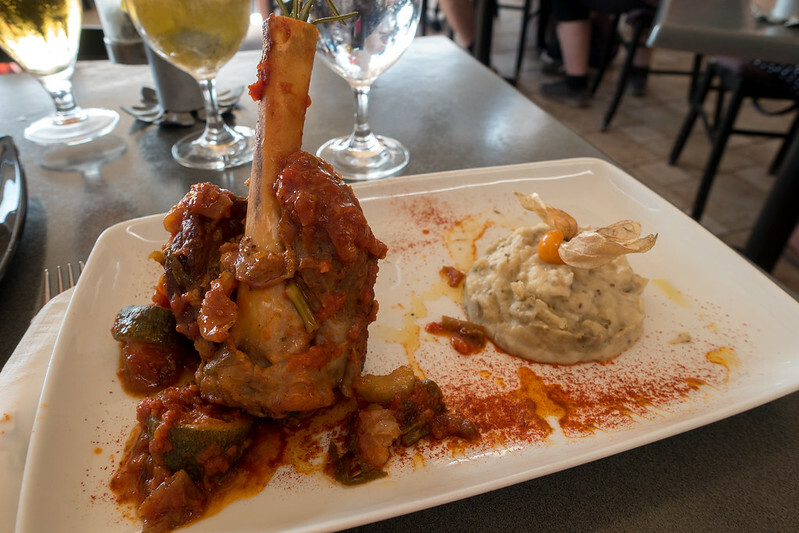 I plumped for the lamb shank casserole: a gorgeously succulent lamb shank, juicy chunks of meat falling off the bone, in a cherry tomato and rosemary sauce and served with smoked white eggplant. 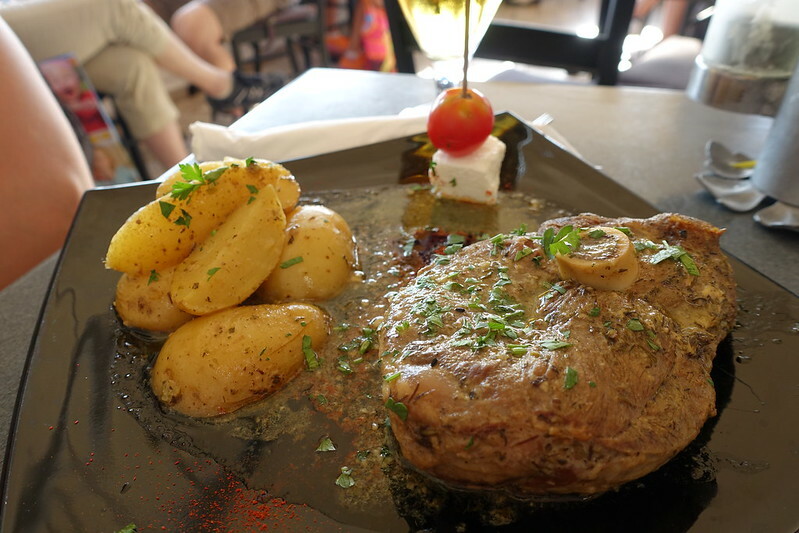 Steve had the baby goat cooked with rosemary, thyme and oregano, which came as a thick bone-in steak served alongside garlic potatoes and garnished with a cube of feta and a cherry tomato. The main courses were delicious, but the desserts were possibly even better! 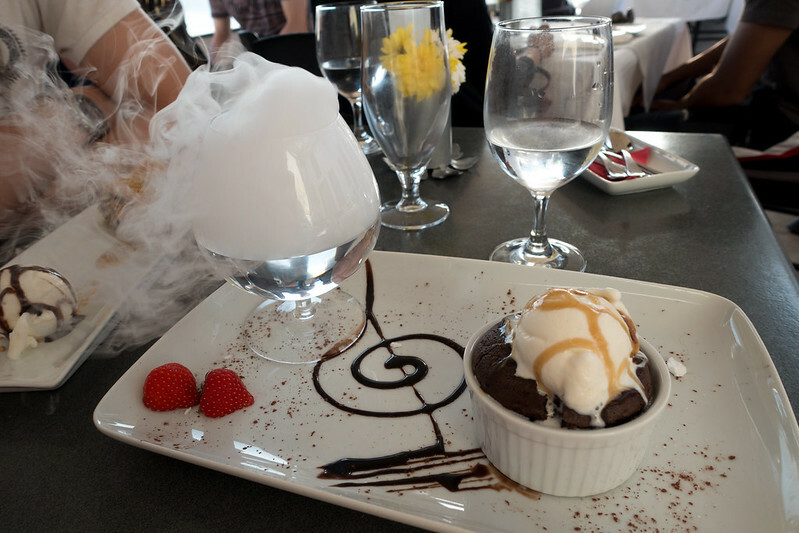 My chocolate souffle with caramel syrup and vanilla ice cream would have been amazing enough on its own, but it was made spectacular by its accompaniment of a large glass of smoking dry ice! This was purely for effect, which it certainly had on us. Steve’s baklava with ice cream was good too, though less theatrical. 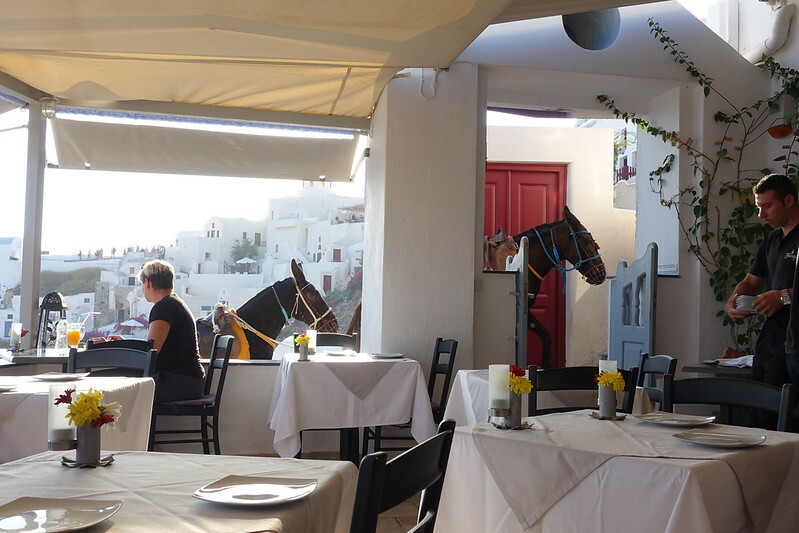 Besides the wonderful food, something I particularly enjoyed about Floga was the contrast between fine dining and the jingling bells of passing donkeys! 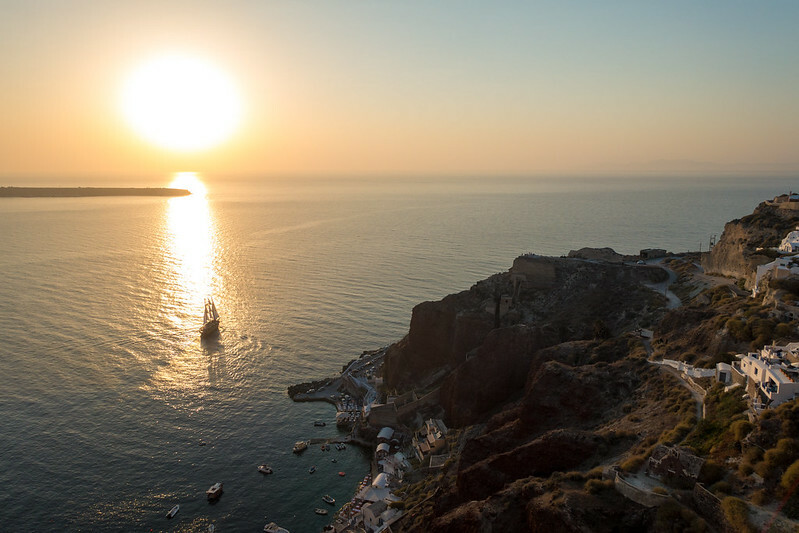 Sunset in Oia is a big deal, and everyone knows it. 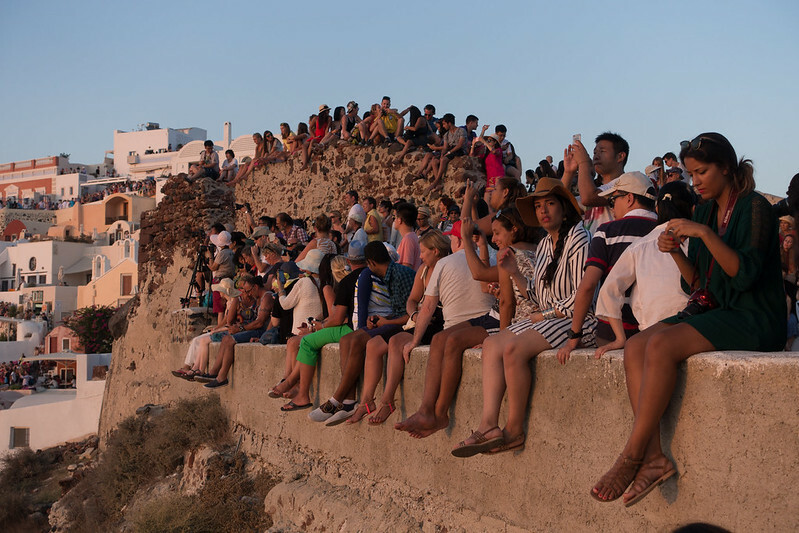 As soon as the sun begins to dip (and possibly even before that), people begin to migrate en-masse to the city’s viewpoints. 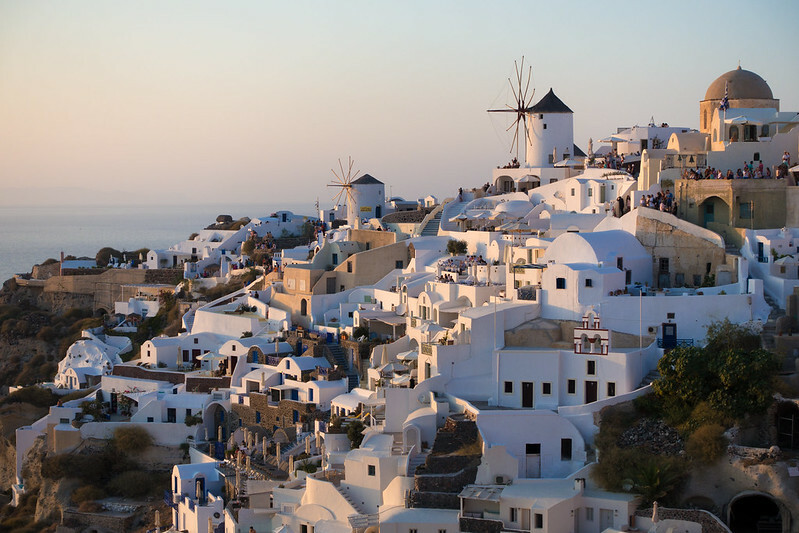 The most famous of these is the ruined castle hanging off the town’s edge. 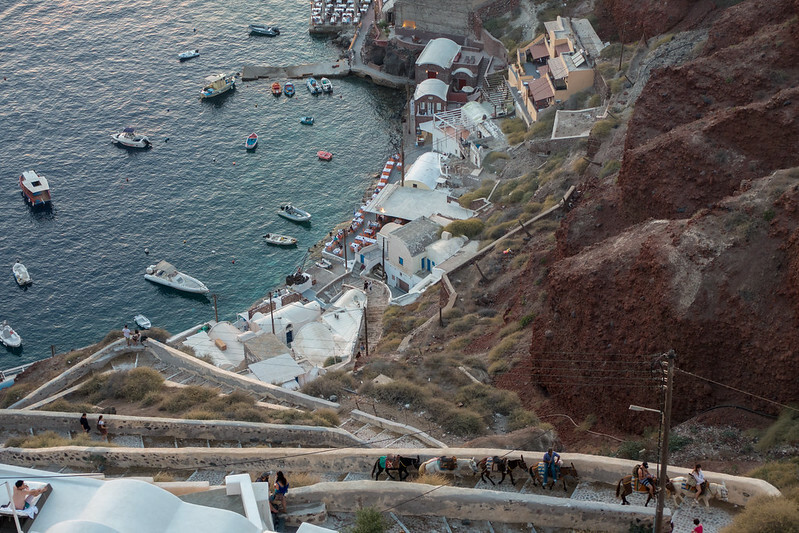 Oia is so small that the castle is easy to find; unfortunately, this enables everyone to do it. Our dinner had made me and Steve a little late to the party, meaning that the small stone promontory of the castle was already packed with people when we got there. But I’m not one to take defeat lying down. So while Steve set up his camera tripod behind a line of already-assembled people, I hauled myself over a stone wall, carefully stepped between several seated people and squeezed myself into the one unoccupied spot on the castle’s furthermost suspended ledge – underneath the tripod of a (thankfully very accepting) photographer. I felt rather cheeky asking whether I could perch underneath this stranger’s tripod, seeing as he’d clearly been there for a long time beforehand; but mostly I just felt triumphant that my audacity had got me the best seat in the house! 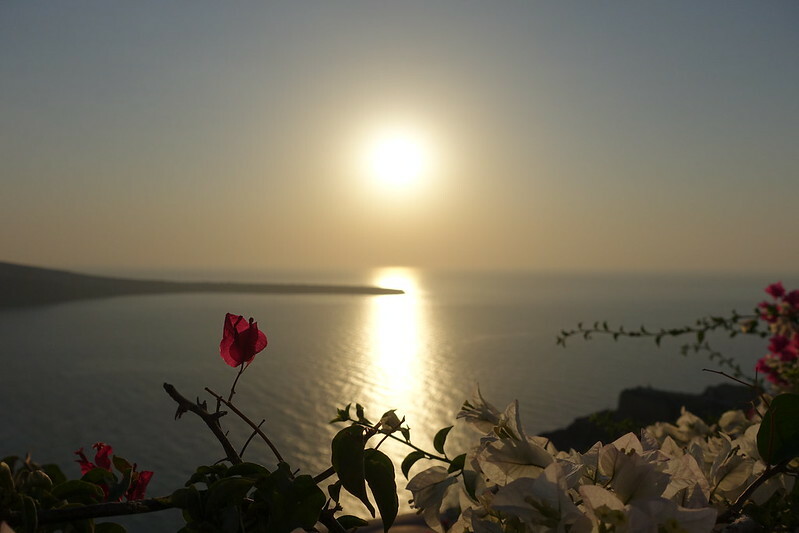 Even in my unusual position, watching the sunset was a wonderfully tranquil experience. 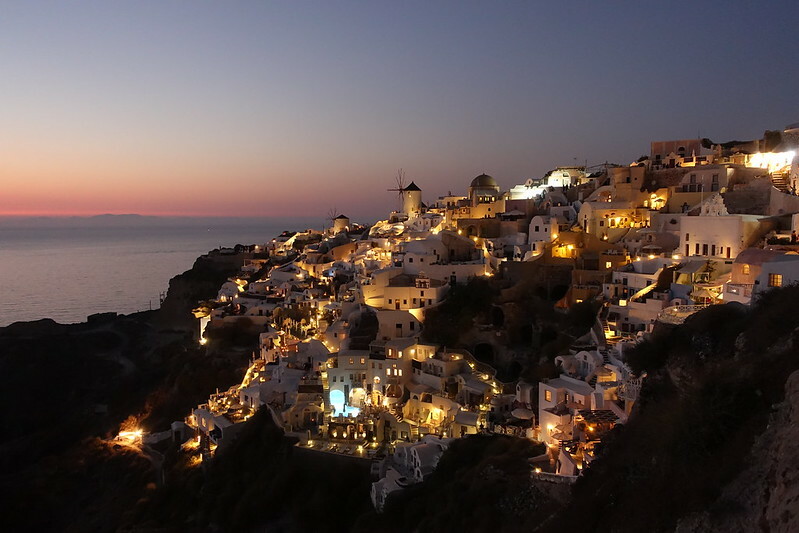 This large crowd of strangers and I, united in our pursuit, were captivated as we watched the sunset-cruise boats gather below, the sky darken, and the piled white buildings of Oia’s famous facade change colour as the sun fell lower. Eventually it slipped beneath the horizon and the crowd thinned out enough for Steve to clamber over to my position. 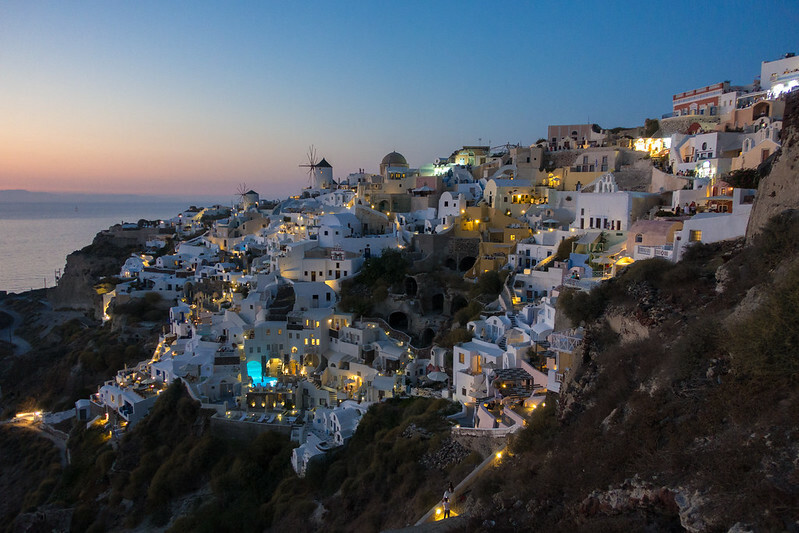 I was glad we were able to watch Oia shift through its final few hues together, until the sky reached its final shade of inky blue-black. Getting back home was a matter of waiting – along with seemingly everyone else who’d been at the castle – for a bus on which we could fit. 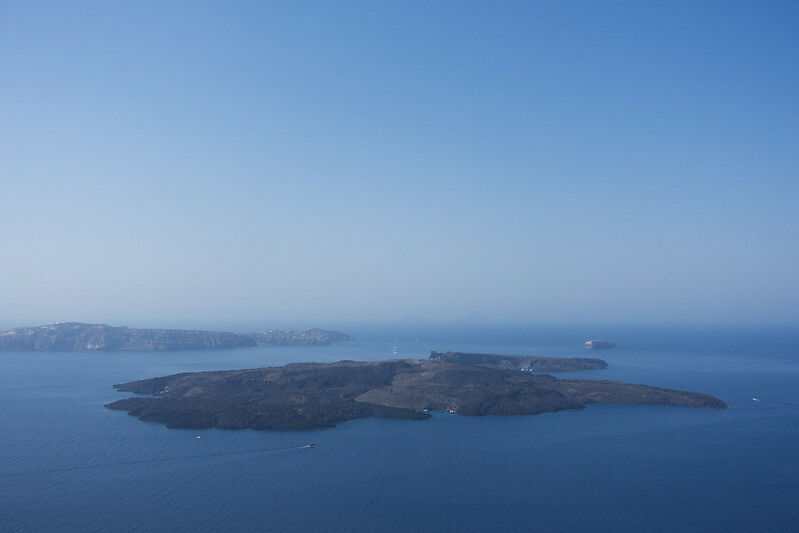 Thankfully there were plenty, and we didn’t have to wait too long before we were back in Firostefani. 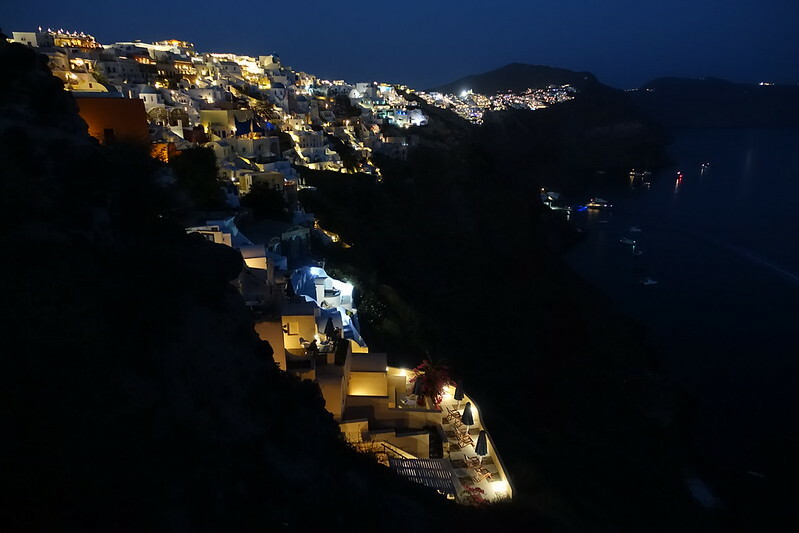 It was still a little early for bed so we went and got nightcaps at Galini Cafe – whisky for Steve and Santorini dessert wine for me – which we savoured while gazing out across the dark water. 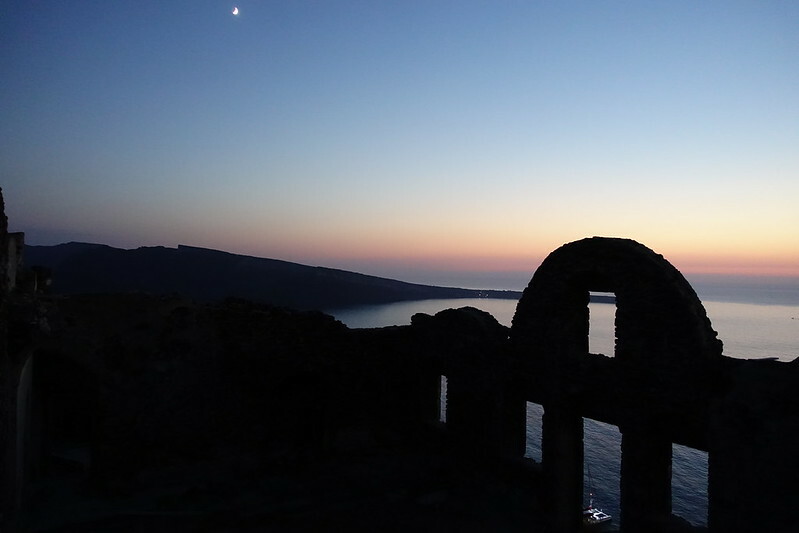 Tomorrow, we’d have another long-awaited sight to behold: the black beach of Perissa. All photos and text (c) Juliet Langton, 2015. All rights reserved. 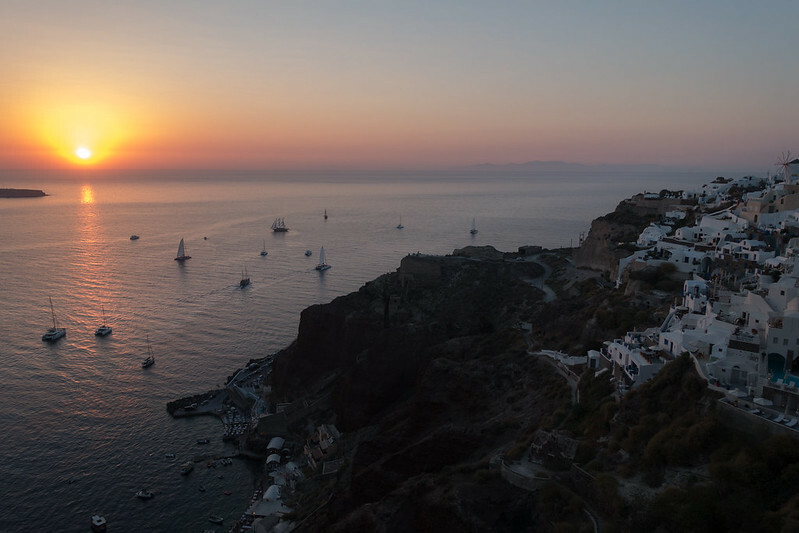 Posted in Greece, Photography, TravelTagged Featured, Floga, hiking, Imerovigli, Oia, Santorini, Skaros Rock, Sunset, WalkingBookmark the permalink.